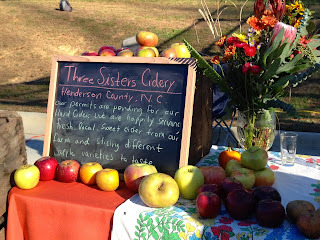 This past weekend was the first ever CiderFest NC, held at Echoview Fiber Mill just north of Asheville. The event benefited the WNC Green Building Council and gave attendees the opportunity to taste ciders from six Southern cider makers and cheeses from local creameries. A gentleman samples McRitchie Cider. CiderFest showcased several of the new cider companies in the Asheville area, including Noble Cider, Black Mountain Cider Works, and Urban Orchard. McRitchie Cider (Thurmond, NC), Windy Hill Cider (York, SC), and Three Sisters Cider (Henderson County, NC), who is in the process of obtaining the necessary permits for production, were also pouring at the festival. One of the things that surprised me the most about the event was the variety that's possible in the world of cider. I knew cider could range from sweet to dry and be flavored with different fruits and spices, but this was the first time I actually got to try some of those libations. My girlfriend and I started with McRitchie Cider. 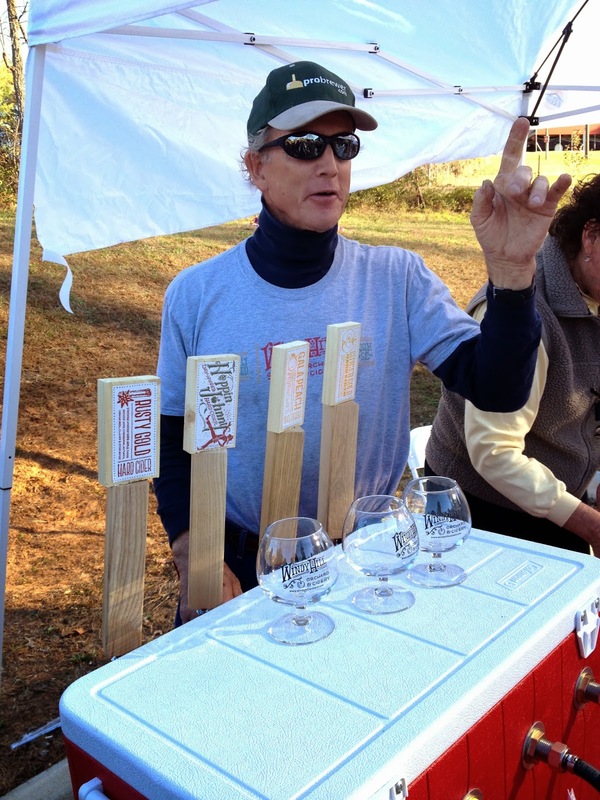 Of all the cideries at CiderFest, McRitchie has been around the longest. (They also make wine at their vineyard and winery.) We tried the semi-sweet Cider and the "Dry" blend. These were brilliantly clear and tasted like the traditional hard ciders I’ve had before. McRitchie Cider can be found at several bottle shops around town, and you can order direct from the McRitchie website. Trevor Baker shares some special blends. Next up we sampled the brand new Urban Orchard Cider Co.. Urban Orchard just opened about two weeks ago and made a big impression with their Ginger Cider. 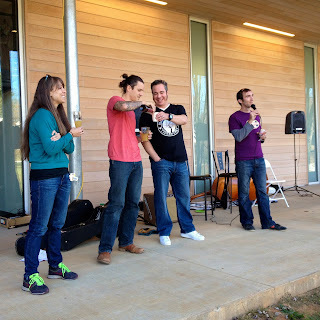 Check out the Urban Orchard Tasting Room at 210 Haywood Rd. in West Asheville, Tues.-Sun., 3pm-11pm. 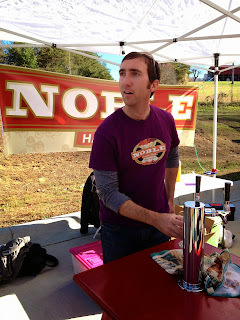 We then tried some samples from the Asheville cider pioneer, Noble Cider, which opened this past summer and recently announced plans to expand production by 1000%. They brought their regular blend (which can be found at the Wedge and other locations around town) as well as a few special ciders. We sampled a small batch dry-hopped cider, using Cascade hops from Echoview Farms. It was an interesting combination of flavors that you don’t come across very often. 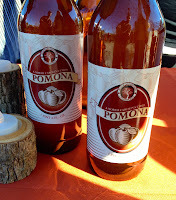 My personal favorite was the cider aged on figs and back-sweetened with denatured brandy. Boozy, spicy and figgy-sweet. Noble also served a very tasty blueberry cider. As with the craft beer movement, education will play a huge role in increasing demand for craft hard cider. While many know that cider is a great alternative for modern gluten-free consumers, few may realize that cider has a long history in this country. There was a time in the US when cider rivaled beer in terms of consumption. 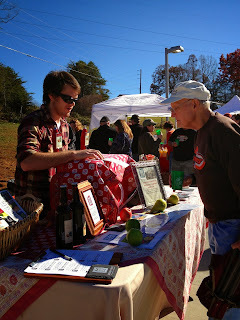 The WNC cider makers held a short Q&A session to share some cider knowledge with festival attendees. Did you know that the US cider market grew by 85% in 2011? Josie Mielke, the “cider mistress” at Urban Orchard, introduced the crowd to her company and gave a quick intro to cider making. After going gluten-free seven years ago, Josie and her husband couldn’t find ciders that weren’t loaded with sugar, so they learned to make her own. They traveled to the UK to attend the Cider Academy and brought that knowledge back to Asheville. Urban Orchard is now a family-owned business, a partnership between Josie, her parents, her husband, and her brother. It was interesting to see the parallels between the young cider movement and the craft brewing industry. The four cider makers referred to the “rising tide” and the camaraderie between them. Rather than being deterred by similar companies all opening at the same time, they felt it was an opportunity to introduce craft cider to an even larger crowd. When running into technical problems, they’re more than happy to help each other out by sharing knowledge and experience. If the cider scene follows in the step of craft beer, it won’t be long before hard cider returns to being the household staple that it used to be. After the information session, we checked out Black Mountain Cider Works. Owners Jessica and David Bowman just got married the day before CiderFest - so cheers to them! Pomona is their flagship cider. It’s currently available at the Native Kitchen & Social Pub in Swannanoa. Look for it soon around Asheville. Our last stop was Windy Hill Orchard, from York, SC. Windy Hill held a long line throughout the festival with Ginger Gold, Gala Peach, Hoppin’ Johnny (dry-hopped cider), and Rusty Gold (spiced with cinnamon, orange peel, nutmeg, cloves, and star anise). Fritz Gusmer, owner of Windy Hill, was quite the salesman -- he allowed people to mix the different ciders into their own delicious concoctions. The WNC cider companies plan to be a positive influence on the local apple growers and are taking steps to make it so. They’re working with the NC Agricultural Extension to plant cider-specific apple varieties that haven’t been grown here before, and could bring in additional revenue for North Carolina agriculture. Cider has enormous potential as a truly local craft beverage -- something Ashevillians are sure to support. 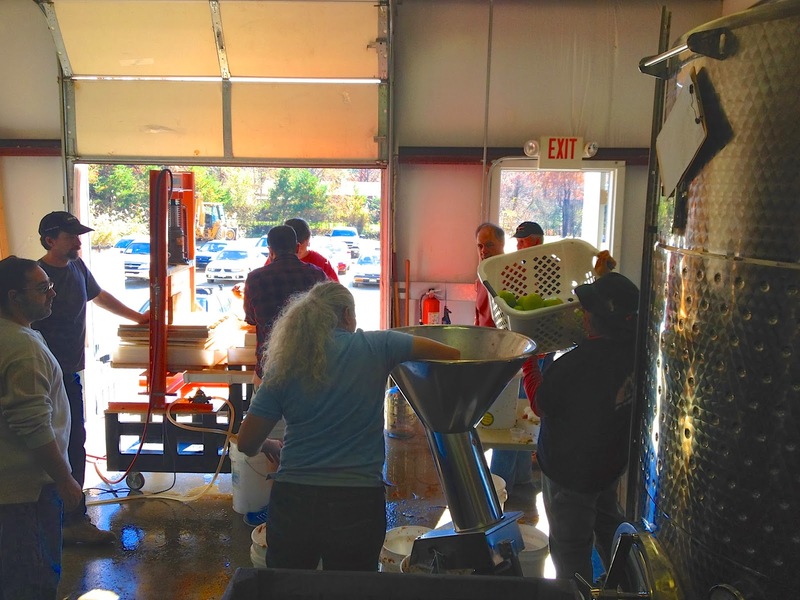 The annual MALT Club cider pressing was held Nov. 3rd in Fletcher, NC. The folks at Noble Cider were kind enough to open their doors to Asheville's homebrew club and help press some 300 gallons of fresh apple juice for club members to take home and make into hard cider. and fruit press at Noble Cider. One member plans to ferment his juice with several pounds of sugar, then distill it into apple brandy. Legal? Maybe. Brilliant? Yes. Ten days in, we're still bubbling! If cider follows in the footsteps of craft beer, the homebrewing crowd is likely to drive support for the region’s new scene. It’s great to see Noble Cider getting ahead of that curve! Big thanks to them for hosting the MALT club. Be sure to join Noble Cider for their 1st Annual Wassailing Party, a fundraiser for the Asheville GreenWorks’ Food Tree Project. Tickets go on sale 11/18. Visit facebook.com/noblecider for more info.